This installment of YouTube Millionaires is brought to you by Epoxy. 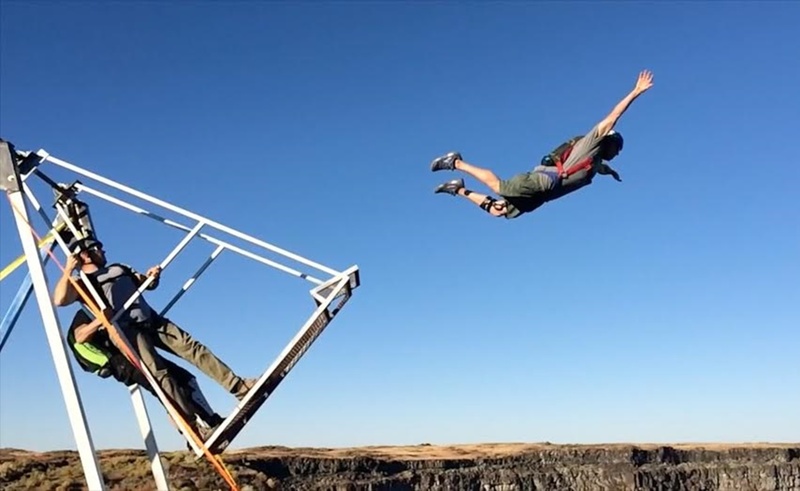 If you want to watch fearless individuals as they dive off bridges, leap over cars, hit insane trick shots, and pull off whatever other audacious stunts come to mind, People Are Awesome should be your next destination. The channel is known for its regular compilations, which collect user-generated videos and assemble them into exhilarating montages. The People Are Awesome brand has stood out since posting its first compilation in 2014, but it truly took off after it was acquired by Jukin Media in September 2015. Since then, it has accelerated its audience, and it recently passed one million subscribers. To celebrate that milestone, we talked to the channel’s founders, Dan Rice and Jean Coffey. People Are Awesome: It’s great! It’s a huge milestone and happened so incredibly fast. We’re super grateful to our fans for watching and sharing our videos. It’s exciting to have built a huge community of people that want to see positive and inspiring content that celebrates human ability and ambition. TF: The word “awesome” gets a lot of use these days. What qualities would you say make a video “awesome”? PAA: People are Awesome is all about showcasing ordinary people doing extraordinary things. By “extraordinary things,” we mean any amazing physical talent, from extreme sports to trick shots to circus arts to displays of physical fitness. The people we feature in our videos are not professional athletes, they are everyday people who are pushing themselves to achieve incredible things, simply for the love of it. An ‘awesome’ clip is really anything that makes us say ‘wow’ and want to share it with the world. TF: How do you find the clips to include in your videos? PAA: We get a lot of great submissions through our website. In addition to that, we spend a lot of time searching YouTube to uncover hidden gems. We want to feature people who have incredible talent but haven’t had a lot of views on their own videos yet; featuring them in our compilations can help promote them and drive traffic to their own channel. TF: Do you field a lot of submissions that don’t make the cut? What are some of the common reasons why clips don’t fit into People Are Awesome montages? PAA: The standard of the submissions is actually really high! We sometimes have to reject clips because the actual video quality is poor (please shoot horizontally!) but more often than not the the tricks are great. TF: What about your music choices? Where do you source those from? PAA: We’re lucky enough to have built a reputation for working with great new music from big acts, so now we have major artists, labels and managers pitching us music for partnerships. In just the past few months we have helped launch new music from bands like Bloc Party, Wolfmother, Band of Skulls, and Digitalism. We love being part an artist’s single release campaign helping to promote their music to our global audience. We also follow some great specialist radio shows and blogs for new artists. TF: Why do you think the list format works well with your channel? PAA: The compilations work well because they showcase a huge amount of content in a very short space of time. They’re extremely engaging because there is no filler, it’s just back to back amazing tricks. TF: How do you decide which people to “introduce” on the People Are Awesome channel? PAA: Sometimes we come across athletes who have so much great content we can’t just choose a single clip to feature in a compilation, so we’ll feature them in a full length video of their own. We’ll work with them to create a showcase of their talents and tell the story of how they developed their skills. TF: How has the People Are Awesome brand been tied into other Jukin Media properties? PAA: We work really closely with the teams on FailArmy, JukinVideo, and The Pet Collective to collaborate and share ideas. There are super talented teams behind all those brands and we’ve learned a lot from them. Last year we edited some of our favorite People are Awesome clips together into a compilation for the “FailArmy Presents” series. They featured the video on their channel and it drove 20,000 new subscribers to People are Awesome in 24 hours. There’s a natural crossover between the two brands; we like to think of ourselves as the Yin and Yang of the Internet! Of course, you can’t achieve something awesome without failing many times along the way, so it’s fun to watch both. Next month we’re collaborating with The Pet Collective to create a Pets are Awesome compilation, featuring animals doing extreme sports like skateboarding and surfing. TF: What’s next for the channel? Any fun plans? PAA: We’ll soon be increasing the amount of compilations we release to include “Best of the Week” compilations alongside our current “Best of the Month” series. We’re also developing several new formats focused on our talented creators, and launching amazing new music from high profile artists. You might also see People Are Awesome on some new video platforms, which is really exciting for us. Our fanbase is growing really quickly, so we just want to make sure to provide enough high-quality content on as many platforms as possible. This installment of YouTube Millionaires is brought to you by Epoxy, the premier company that helps multi-platform creators and digital networks distribute videos, engage with fans, measure success, and grow their communities across the social web. Check out Epoxy’s new Sharing Studio, a place for quickly creating and distributing native social content from your YouTube channels.